Google made its case Wednesday for Chrome use in the enterprise, and a big part of its pitch is that companies can integrate products they’re already using with its Chrome devices and software. Outlined in detail during a two-hour webcast, Google’s Chrome for Work strategy includes an expanding number of ways that companies can include Chrome OS in their technology mix without having to give up the hardware and software they have in place. Chromebook integration with Box, for instance, was one of the announcements at the event. There were also demonstrations that involved Citrix Systems’ GoToMeeting, SAP’s Fiori software and the Pulse Secure VPN, for example. Google’s own Apps, by contrast, which might have been given a central role, were largely absent. “Overall, I think the Chrome for Work pitch probably constitutes Google’s most disruptive move to date,” said Charles King, principal analyst with Pund-IT. 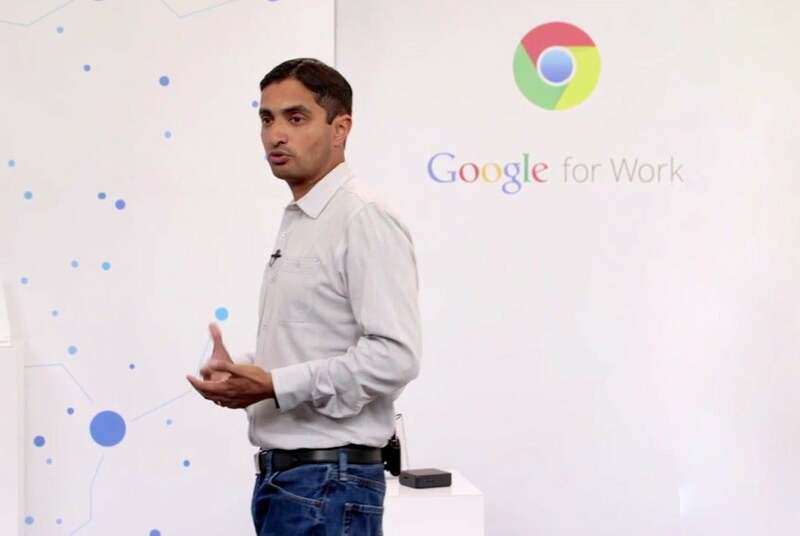 Google's Rajen Sheth at the Chrome for Work event Wednesday. The new Chrome for Work offerings demonstrate that Google is moving “actively and aggressively” in this arena, both on its own and with the help of partners like Dell and HP. “It would be a mistake for Microsoft or anyone else to underestimate the company’s ambitions or its Chrome solutions,” King said. At the same time, Google suffers from a trust problem in the enterprise, said Rob Enderle, principal analyst with Enderle Group. “IT has been burned a lot over the years by companies that didnt understand their business and couldnt step up to the service requirements they have,” Enderle said. Google was keen to introduce some of those reference customers Wednesday, mentioning that Netflix, Pinterest and clothing chain Chico’s all use its work tools. Google will need to develop a reputation and an image that IT can trust, Enderle said—something its ongoing antitrust struggles won’t help. Google’s other announcements at the Chrome Live event on Wednesday included a new version of Chromebox for meetings capable of accommodating up to 20 people along with new pricing flexibility and improvements to its management services for Chrome-dedicated devices.